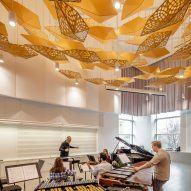 American studio LMN Architects has completed a performing arts centre for the University of Iowa that features twisted terracotta panels, glass shingles and bespoke acoustic panels made of metal and felt. 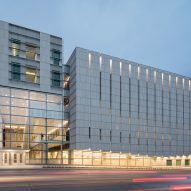 The Voxman Music Building is situated between the university’s campus and the downtown core of Iowa City. L-shaped in plan, the six-storey building occupies a prominent corner site. 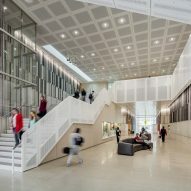 The building aims to celebrate music "at every turn", and to provide a collaborative and exploratory environment that allows every space to be used for performances. 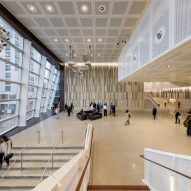 "While featuring a number of stunning performance spaces, the building also embraces the idea that the future of musical performance is more fluid than fixed space performance, so the entire building was imagined as possible performance space," said LMN Architects, a Seattle-based firm. 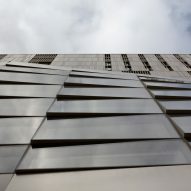 The building is wrapped in light-grey terracotta panels, some of which are twisted, and low-iron glass with delicate shading patterns. Portions of the facades cantilever over the sidewalks, lending a sense of dynamism to the exterior. 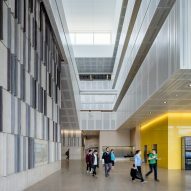 On the north and west elevations, glass walls provide clear views into a multi-storey atrium, helping connect the centre to the surrounding neighbourhood, and reinforcing the "merger of campus and city". 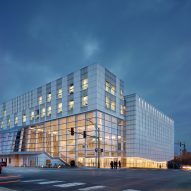 "The pattern of streets and open spaces in the mixed-use district of Iowa City extends directly into the building's multi-level interior spaces, cultivating a sense of vertical urban vitality and acknowledging its place within the community," said LMN, which collaborated with Neumann Monson Architects on the project. Encompassing 186,000 square feet (17,280 square metres), the building contains a 700-seat concert hall and 200-seat recital hall. 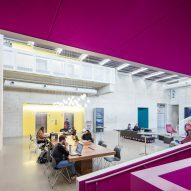 Other programmatic elements include rehearsal rooms, a music library, classrooms and faculty studios. 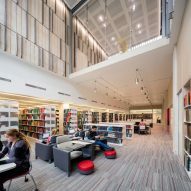 Interspersed throughout the building are circulation and social spaces bathed in natural light. 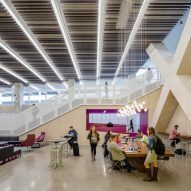 The team used digital design and fabrication tools to meet the advanced technical needs for the performance spaces. 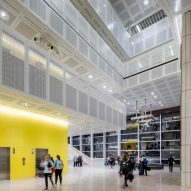 Suspended from the ceiling in the main auditorium is a "theatroacoustic" system that accommodates acoustic, lighting and life-safety requirements. 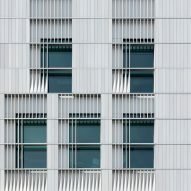 "The resulting intricately sculpted element is assembled out of 946 unique, folded-aluminium composite modules," the team said. "No two are alike." 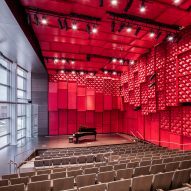 In the recital hall, the ceiling and walls are covered with bright red acoustic panels. Many have a pyramidal texture, which increases a panel's overall surface area and heightens the level of acoustic control. 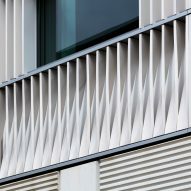 "Digital simulations of acoustic diffusion alongside 3D-printed formal variants enabled the team to devise a unique, high-performance, modular system," said the studio. The recital room also features wooden flooring and a "wall-sized, shingled-glass window that unites the performance event with the urban experience". Moreover, the glass shingles help prevent ambient exterior noise from entering the room, according to the architects. In rehearsal spaces, the team hung swarms of kite-shape, aluminium reflectors from high ceilings. The faceted panels vary between solid and perforated to create acoustic and lighting effects. 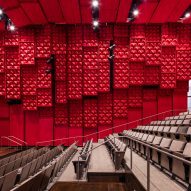 In a room created specifically for an organ, the team conceived two acoustic metal screens that stretch the full height of the space. 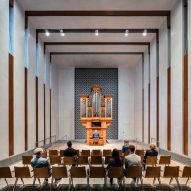 "Their simple geometric form coupled with Venetian plaster walls creates warm, reverberant acoustics that complement the instrument’s materials and craftsmanship," LMN Architects said. 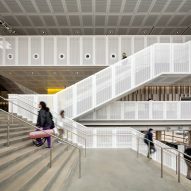 To optimise sound quality in public zones with exposed concrete, the architects developed a system of felt fins that were installed within walls and ceilings. 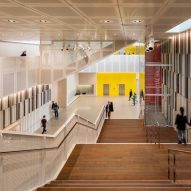 "The effect both serves to acoustically dampen the spaces and soften the tactile quality of the building," said the studio. 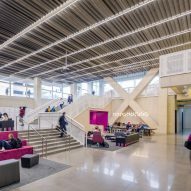 The building has a number of sustainable features, including active daylighting controls, chilled beams, and a heat-recovery system that ties into the campus's chilled water loop. 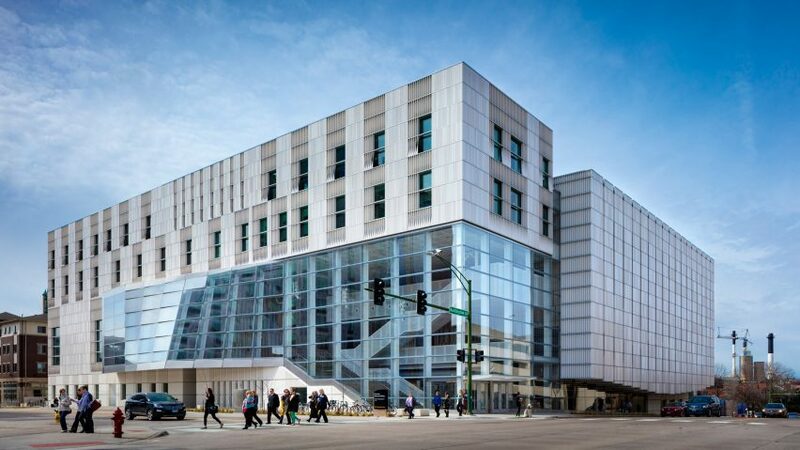 The project has earned LEED Gold certification from the US Green Building Council. 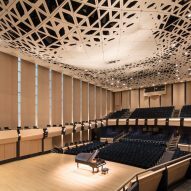 Other concert venues in North America include a massive performing arts centre in Calgary by Allied Works that is wrapped in bronze-hued tiles, and an open-air theatre in Quebec by Atelier Paul Laurendeau that is topped with a vast red roof. Photography is by Tim Griffith unless otherwise noted.